The very first SVHC Cross Country Championships took place on Saturday 20th March 1971. The venue was Pollok Estate, Glasgow. 33 ran and 32 finished the course. Willie Russell won, followed by Hugh Mitchell, Willie Marshall, Tom Stevenson, Willie Armour, Chick Forbes, Jack McLean and Andy Forbes, who won the Over 50 title from Tommy Harrison and Walter Ross. John Emmet Farrell was first Over 60, in front of Harry Haughie and Roddy Devon. Shettleston Harriers won the Team Award. 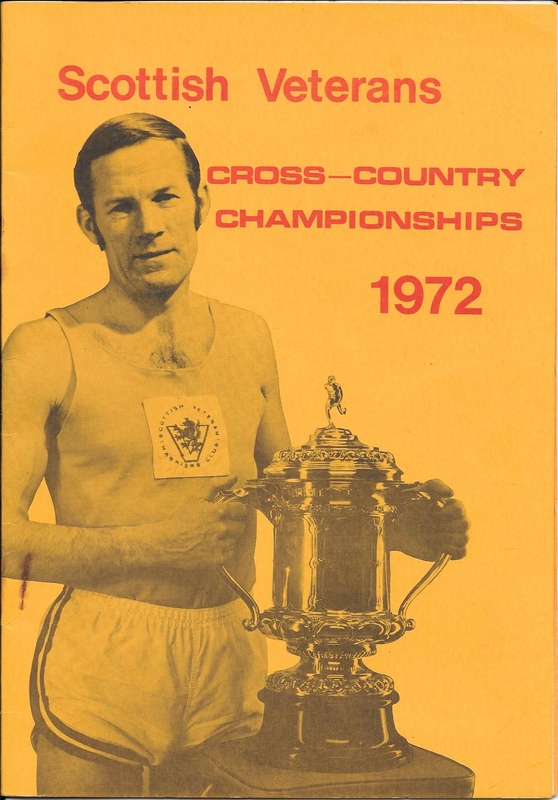 The second Championship, this time officially recognised by the Scottish Cross Country Union, was on 4th March 1972, at Clydebank, Dunbartonshire. The course was five miles (or eight kilometres) long. The SVHC organised the event, assisted by Clydesdale Harriers. Bill Stoddart (Greenock Wellpark H) won easily, from Hugh Mitchell (Shettleston H) and Moir Logie (East Kilbride AAC). M50 champion was Andy Forbes (Victoria Park AAC), in front of Tommy Harrison (Maryhill H) and Walter Ross (Garscube H). Emmet Farrell (Maryhill H) retained his M60 title from Ron Smith (SVHC) and George Taylor (Shettleston H). Greenock Wellpark Harriers won the Team Award. In the programme, Walter Ross, the SVHC Secretary, and a very important figure in the development of Scottish Veteran Athletics, published a poem (written many years earlier by an anonymous Clydesdale Harrier). Walter suggested it could be retitled ‘To a Veteran’. Go swinging on your way. O runners through the rain. Rain, sunshine, snow or sleet. You pass on flying feet. No cheers your efforts wake. you run for running’s sake. To leave long miles behind. for I can stand the pace. The ‘anonymous Clydesdale Harrier was Thomas Millar who had been club secretary for many years and contributed to the local Press under the pen name ‘Excelsior’. After being a member for decades he moved to the English Midlands which was where he sought work as an accountant. His son Gavin is a film director, BBC programme producer, director, actor and has been responsible for many excellent programmes.